True confession: I am not a jam-band kind of girl. I’ve gone to local shows, listened to Phish blasting out of dorm room windows, and friends have made me Béla Fleck mixes. Still, nothing has changed my mind. That said, I have to give credit to Hubbardton-based quartet Twiddle. With their first full-length studio effort, Natural Evolution of Consciousness, they’ve almost made me a believer. The disc didn’t grab me at first — it sounded like one long, neverending song. If I weren’t watching the track listings go by, I would have had no idea of where I was or what was playing. In particular, the record gets bogged down somewhere between “Less Than Ostentatious” — which is just the opposite, really — and the very next song, “Tiberius.” The latter is an obnoxiously repetitive, 8-minute beast choking up the middle of the album. However, I’ll admit that on second listen, the disc grew on me. There are some really bright moments that even a nonbeliever can enjoy. “Jamflowman” is an incredibly catchy song with a fantastic music-box piano tune — courtesy of keyboardist Ryan Dempsey — in the middle of an otherwise reggae-fueled dance jam. “Subconscious Prelude” is the album’s sparkling gem. It’s a beautifully mellow track that showcases all members of the band. Though they’ve only been together since 2005, Twiddle play more cohesively than some bands that have been together much longer. Over time, they’re bound to improve. Guitarist/vocalist Mihali “Mickey” Savaloudis’ loopy and distinctive voice is refreshing. If Jack Black and Dave Matthews had a child, he would sing like Savaloudis, and that’s a good thing. Dempsey, drummer Brook Jordan and bassist Billy Comstock — who has since been replaced by Zdenek Gubb — hold down the album’s mellow funk- and reggae-tinged vibe. In short, even I cannot deny that these guys are talented musicians with a devoted following. Twiddle are quickly carving out their own distinctive nook in Burlington’s music scene — they were Higher Ground’s “Artist of the Month” in April — and Natural Evolution of Consciousness is a decent debut from Vermont’s newest indie-jammers. 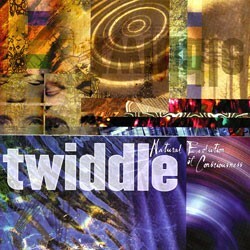 If someone were to compile a summer soundtrack for Burlington, more than a little Twiddle would likely make the cut. But I’ll still pass on the Phish and Fleck.